The mood amongst European manufacturers of plastics and rubber processing machines is excellent. Production has increased to an estimated €15.3 billion since 2009, which corresponds to 99% growth over the last eight years. In 2017, production output of the industry sector organised under the Euromap umbrella association experienced above average growth amounting to 7%. And thus it’s no wonder that plastics processing companies are doing well, because plastics are not only being used in automotive and packaging technology more and more frequently, efficiently and diversely. Fakuma will also present application options in the construction sector. For example, BASF recently increased production capacity by 40,000 tons per year for Neopor, which is used as an insulating material. The grey successor to conventional Styrofoam is lighter and more efficient than its white predecessor. However, not only the latest materials and their possible uses will be showcased in Friedrichshafen. Simultaneously rising demand for better and better performance, as well as top quality, necessitates an unrelenting innovative spirit and new developments. Whether injection moulding, extrusion, thermoforming, foaming or 3D printing is involved – raw materials producers, machine builders and manufacturers of precision parts will present all they have to offer in the way of innovation throughout the entire value chain at the exclusive industry meet. The trade fair with continuously growing international recognition is taken advantage of by numerous exhibitors in order to unveil their new products to a broad-based audience for the first time. There’s no end in sight to the success of the industry sector (or Fakuma as its representative trade fair). Due to the persistently good order situation, Euromap is expecting turnover growth amounting to 2% this year. Propensity to invest in new machines and systems remains high, which is affecting lead-times for materials and machine. At the same time, steady growth is being impeded by the lack of qualified personnel. “This fact may well provide additional impetus for the automation solutions exhibited at Fakuma”, surmises Fakuma project manager Annemarie Schur. Plastics are long since not just a German or European business factor. This is demonstrated by the expert visitors who have travelled from distant countries to attend the industry event in recent years. Expert visitors, specialists and decision-makers journeyed to the last event in 2017 from more than 120 countries. 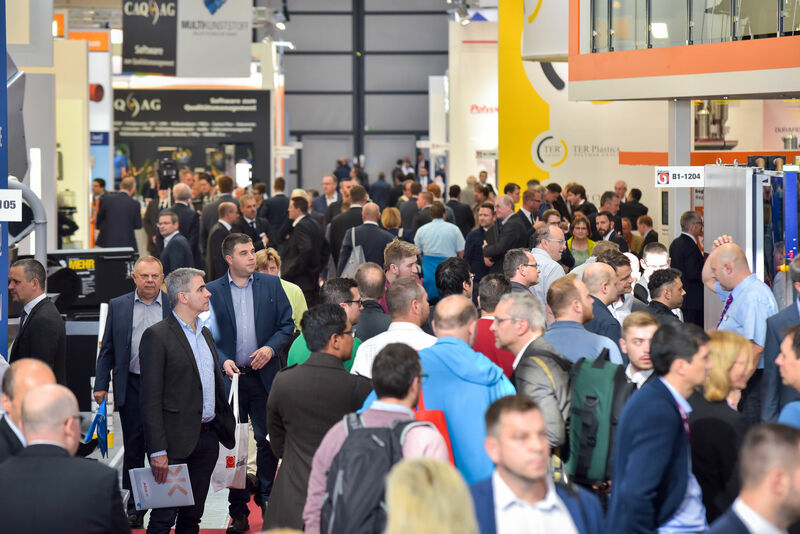 48,375 expert visitors accepted the invitation of the roughly 1900 exhibitors to attend the event in Friedrichshafen on Lake Constance where Germany, Austria and Switzerland meet – and the numbers continue to rise. In addition to innumerable participants from Germany and elsewhere in Europe, above all the number of visitors from Asia is increasing. And the Asians are profiting from international growth of the industry sector as well. In particular Chinese competitors have become stronger according to Euromap. In 2017 they produced machines and systems valued at €11.1 billion – 180% more than in 2009.